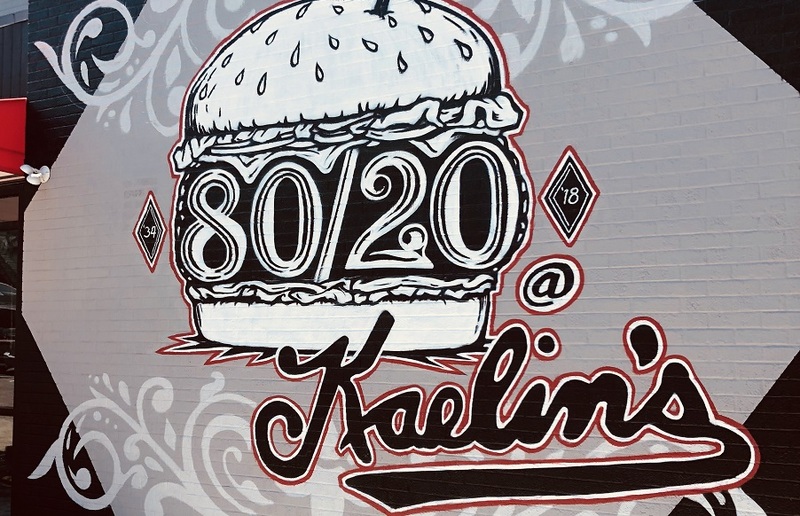 It’s been two years in the making, and 80/20 at Kaelin’s is ready to open its doors with a big bash during their grand opening June 7 from 5 p.m. to 10 p.m. at 1801 Newburg Rd. at the corner of Speed Ave. Locals will recognize the familiar sign that says “If you can’t stop, please wave” and the large original Kaelin’s neon sign now restored and hanging from a post out front. Seating is limited. Considering the number of locals who have been anxiously waiting this opening (including us), it would be wise to make your reservation by clicking here. The new menu includes food items like burgers, barbecue, fried chicken and more plus cocktails and ice cream made in house. The historical building has had a couple of other tenants, but for 70 years, it housed the famous Kaelin’s restaurant, who opened in 1934 and claims to have invented the cheeseburger. The owners of 80/20, Chris Fenton, Matt Staggs and Bill DuBurg, have woven the history of the building into their new concept. The renovation is the culmination of two years and $1 million worth of updates and considerations. The upstairs event space has an external elevator to provide handicap access, and the same depth of thought has been given to the entire restaurant’s details. It’s not hard to find historical details throughout the massive space that is split into a dining room, a retro malt shop and a bar. The owners have the building’s original windows hung on the walls as frames for photos of their renovation process, old menus from Kaelin’s (with beers for 10 cents) and other interesting memorabilia. The retro ice cream parlor utilizes vintage equipment, and the hostess stand is a breading table that once belonged to the famous Kentucky Colonel Harland Sanders, whose famous chicken was sold at Kaelin’s before he had his own brick and mortar. But woven with this history, modern details like Edison bulbs, a bourbon wall made of reclaimed wood with a ladder for staff to climb, a large pass through window from the bar to the patio, external murals and a slick dining room all bring the past into the future. The regular ongoing hours are still to be determined, but they are taking calls for their catering and event space. You can call Chris at 502-200-8020 for details. They are posting announcements to their Facebook page.